In keeping with its focus on all things 3D, Panasonic has announced that it will release the world's first* professional, fully-integrated Full HD 3D camcorder later this year. Note the asterisk. By 'world's first' Panasonic means the world's first "integrated twin-lens Full HD 3D camcorder capable of recording Full HD 3D video to Memory Cards." Just to be clear. So don't get too excited. This isn't a gadget that you'll eventually be able to reserve at Argos. Instead, Panasonic is focusing squarely on the professional market with this new camcorder, hoping to capitalise on the growing market for 3D content production. According to Panasonic, right and left Full HD video streams can be recorded directly onto SDHC/SD memory cards. 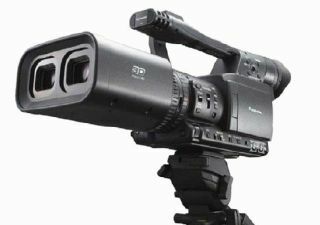 The Twin-lens Full HD 3D camcorder will be made to order from April onwards and Panasonic has suggested a price tag of $21,000.